Pilar Mata Dupont is a multidisciplinary artist working mainly in photography and film. She has exhibited collaborative and solo work at galleries such as Centre Pompidou, Paris; The Akademie der Künste, Berlin; Museum of Contemporary Art, Sydney; Gallery of Modern Art, Brisbane; on Cockatoo Island for the 17th Biennale of Sydney and in festivals and fairs like Art Basel, Miami, and the CineB Film Festival, Chile. In 2010 she won the prestigious Basil Sellers Art Prize with Tarryn Gill for their film, ‘Gymnasium’. Her work engages with, or subverts, tropes used in storytelling through the re-imagination of collected memories/histories and mythologies, and investigates into the genre of magic realism as a device to explore the effects of colonialism, nationalism, and militarised societies. Where are you from? What cities, and/or countries have you lived in – or what places have influenced you? PMD: I was born in Perth, Western Australia to parents who had recently emigrated from Argentina. As a child I lived briefly in Buenos Aires, and then lived in Brunei for three years in the late 80s. In the last year I have become a sort of nomad, moving from one project/residency to the next wherever that may take me. PMD: I remember getting a camera for my birthday when I was eight. I can’t even picture the camera itself now, but I remember my first photo was of a stray puppy on the street in Brunei – I still have the print somewhere. The camera was stolen in Mexico when we were visiting family. My dad was a keen photographer and used to have a darkroom when he was younger. Eventually I inherited a nice little Pentax with some great lenses from him. You spent (the past) five years producing collaborative work, how has that period affected the work you are currently making? Or is it possible to make that distinction? PMD: My other collaborative practices (with Tarryn Gill and with Hold Your Horses) have taken up the best part of 11 years. Both have been quite successful, and the projects have often been on a very large scale (one was a full length stage musical), so they took most of my time. Obviously I am still working using some references and interests I had from that time, but I think the main aspect I took from these practices was the ability to work collaboratively successfully, and finding enjoyment in that process. Most of my work is collaborative in some way, whether the collaborator is also an artist, or an actor, composer, lighting technician etc. This series I have in Laatikkomo is one of the few projects I have worked on entirely on my own. You are now in a kind of nomadic traveling mode, do you travel to research a subject or does the subject come out of the place you are visiting? PMD: A little of both, but I generally have a basic idea of what I am interested in when I go to a country where I plan to make work – however I can sometimes become interested in something else entirely once I am there. For example, when I went to Finland the first time I went because of my interest in Finnish tango, but for one of my film pieces I ended up working with neo-lament singers in Helsinki, and I also made a film using ice hockey to play out the battles of the Winter War (between Finland and the Soviet Union 1939/40). I am traveling to South Korea soon to make work dealing with utopic notions of reconciliation, and division using the divide between North Korea (which I visited last year) and South Korea. After that I am going to Argentina to make a work about my family history. I gather from your titles that your images grow out of an extensive foundation of research. Is this common practice for you or is it particular to this specific project? PMD: All of my work stems from quite heavy and specific research, though often I don’t have as much time with a subject as I’d like. This particular work came from a very odd coincidence. My brother is in the Australian bobsleigh team and I was following him around during the European Cup early this year. One of the stops was Schönau am Königssee in Bavaria, Germany. The scenery was utterly spectacular in January and I spent much of my time taking photographs and filming from boats or in the mountains. In late January I had a research residency as part of a group of artists from Perth at the Freud Museum in London, and while looking in one of the Freud family’s photo albums I found photographs of the same mountains I had been shooting in. The area had been a favourite holiday spot for Sigmund Freud and he had written his seminal work, ‘The Interpretation of Dreams’, there in 1898. 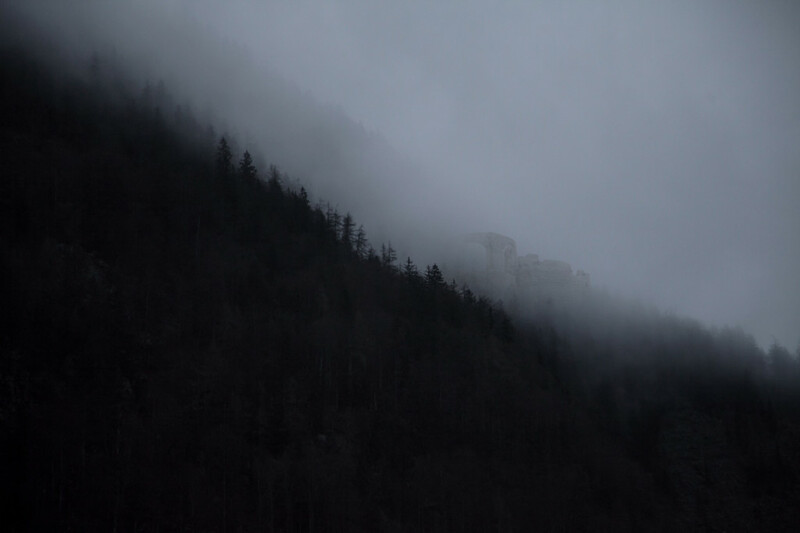 During his stay he had a series of dreams about Rome, one of which he saw misty visions of Roman ruins in alpine settings. 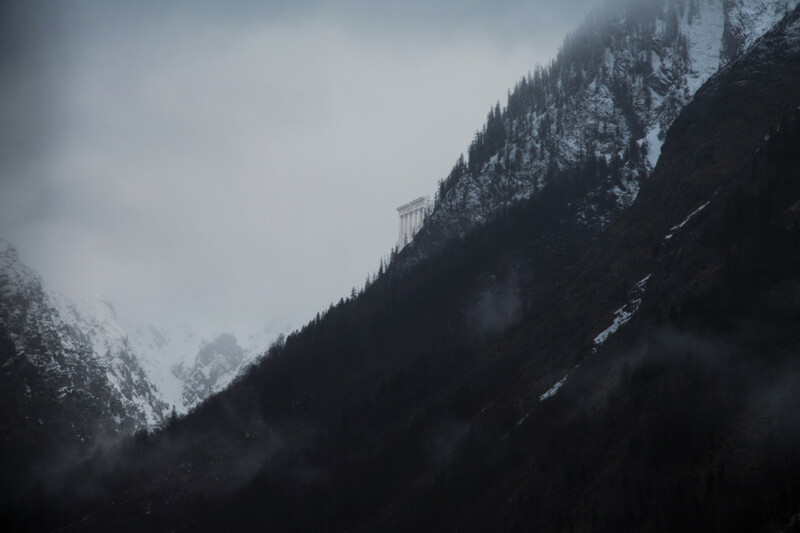 The area is also infamous as a site because Adolf Hitler had his home in nearby Berchtesgaden (Obersalzberg) and it became a hub for the National Socialists in the 1930s. Hitler wrote the second half of ‘Mein Kampf’ there at his home, the Berghof. Heinrich Himmler was eventually given the Freud’s holiday home in Schönau. The area was also a holiday spot for Johannes Brahms, Robert and Clara Schumann, Theodor Fontane, Caspar David Friedrich, and Bavarian royalty. The classical architecture transposed into such picturesque and dramatic, almost Wagnerian, mountains in an area with such a history could be read in many ways; the ruins also being seen as remnants of the broken ideology that invaded the area in the 1930s. What does history mean to you? And what place does it hold in your work? PMD: History and memory have always played a big part in my work. For me the interest lies in the flexibility of the narrative in both cases, and how easily history and memory can be warped, disfigured, or glorified. I am also interested in the triggers of nostalgia and the manipulation of those sentiments for political and personal means. Could you list 5 words you were thinking about when you captured this image (or series)? Part of the Laatikkomo project asks the artists to choose the next photographer in their link of photographers. What qualities are you looking for in the artist you will choose, what criteria will guide your choice? PMD: I have already chosen the next photographer. I chose her not only because I think her work is great, but also because she, like I, has fallen in love with the North (in her case Sweden, and in my case, Finland). Her work shows a beautiful sensitivity to her subjects, which I really enjoy. Thank you so much Pilar, we look forward to seeing where your link will take us.